The Breeze Round Exposed Dual Function Diverter Shower System features a useful shelf for all your bathroom toiletries. The shower also boasts an automatic shut down if the cold water pressure should suddenly fail and is limescale resistant. 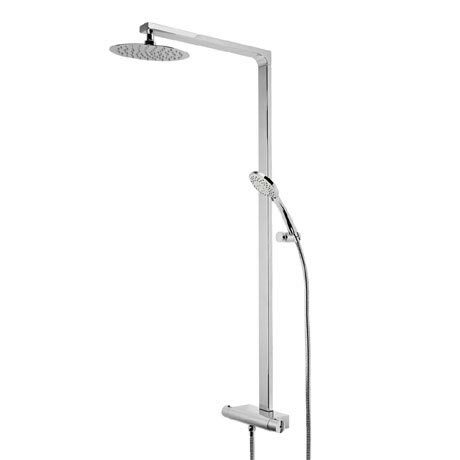 Package includes a thermostatic diverter bar valve with accessory shelf, rigid riser rail, 250mm stainless steel shower head, Air-drive 5 function shower handset, wall mounted brass adjustable handset holder and shower hose. Air-drive handsets are water saving creating an aerated bubble spray that uses less water.